I mean I really, really, love color. When asked for my favorite, I usually stare into deep space and mutter something like... "Wow... gee... hmmm... I love soooo many colors." How do I choose just one, as in one piece of candy, when I'm standing in the middle of a whole candy factory? How about two? It's hard to imagine a life without Black & White, the 'Boss' of hues that add punch and contrast to all other colors. But choosing them excludes the warm tones of oranges and pinks, trendy lime green, the cool shades of blues and violets, some fully saturated and others high key. One? Two? How about infinite color favorites, with the exception of Beige, that whitish, grayish, orangish, brownish pigment which some call cream and I call the ultimate color of indecision. Okay... final answer... my favorite color is... any color 'with attitude'. 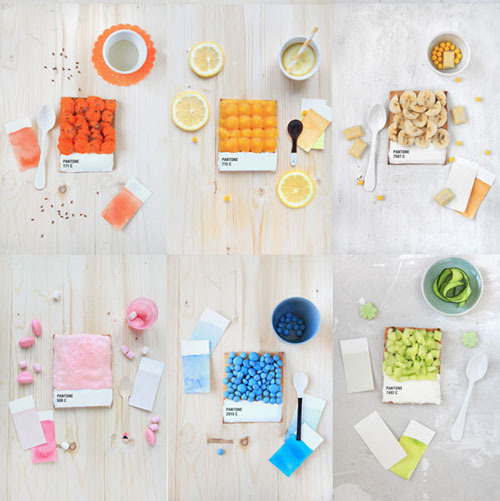 Here are a few pieces by Emilie de Griottes, a food photographer and graphic designer with a great attitude about color, calling these works Pantone Tarts... Pantone, referring to the colors designers use, and tarts as in delicious desserts. Click here to discover Pantone's 'Color of the Year 2012'... It's sizzling! If you love this color, Revlon has a lipstick, Colorburst Lip Butter, called 'Tutti Frutti' which is a close match to the declared 'color of the year'... smooch! 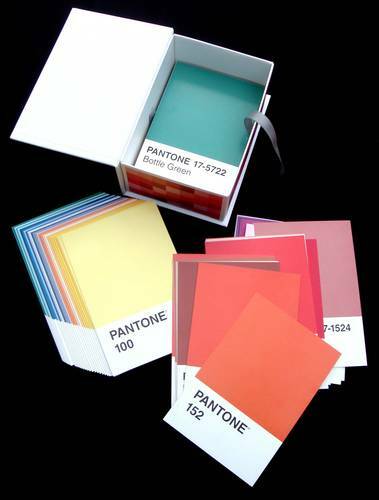 For more Pantone products go here. 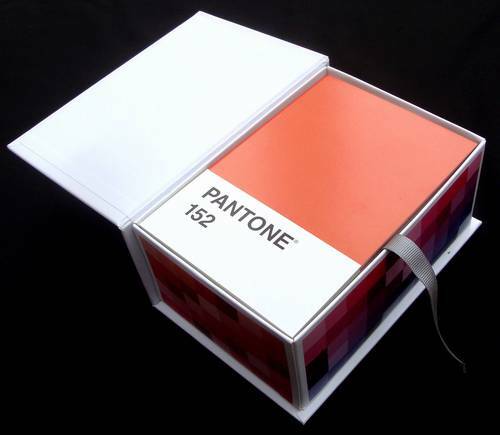 I particularly like the Pantone notebooks and I'm absolutely crazy about the box of 100 Pantone postcards I saw here. They look too precious to write on or send through the mail. Maybe I can part with a few... beige ones. Do you have a favorite color?... a color you think you look good in?... or one you are obsessed with? Please share your color musings by clicking on the word 'comment' below. I hope it won't take you as long to decide on a color as it did me. I can never decide on just one color! I must have at least 2. At the moment: plum and lime or even a more lemony green. Yellow Green (not green yellow). Hah! Or perhaps tangerine and eggplant. 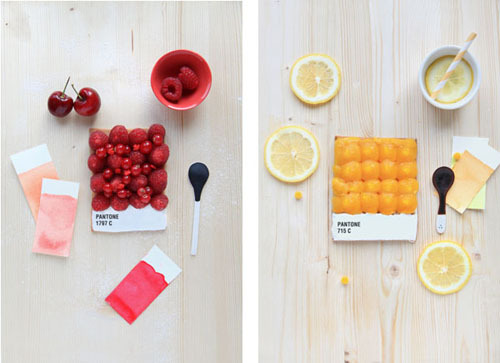 Colors best describe in terms of fruits and vegetables. Salmon and raddichio. I love this color. But I can never stick with one -two -three colors when I make my quilts. Colors, like fashion, are constantly IN and then OUT !! That's why I like to make a multi-colored or scrappy quilt. There will always be a color in the quilt that is IN !! Have you been to Etsy on the computer? Great photos... great organization... great job on the blog, Dyan !! Dale Chihuly said, "I never met a color I didn't like". I would have to agree with that statement. Although, I am partial to reds and purples. Also, I seem to get a lot of positive comments when I wear red. We just had the interior of our house painted. I did an accent wall in the most lovely shade of lavender in the living room. The rest of the walls are a light gray and the two colors look great together. We lived with white wall for so many years and I was sick to death of them. I admit that the lavender wall had me a little worried before we did it but when I saw it, I was thrilled with how it looked. It picks up the colors of the accent pillows and a few other pieces in the room.